If you’re a coffee lover (or tea, or hot chocolate…) you might have seen all the cool Sharpie mug ideas floating around. It’s crazy, you can design a custom coffee mug with nothing more than a few Sharpies! We found so many crazy cool sharpie mug ideas that we had to share our favorites. By placing a letter sticker on your mug and making confetti dots all around it with different color Sharpies you can create a cool monogram. This idea from Designer Trapped in a Lawyer’s Body is so clever. Does this ring make me look engaged? I just love this idea as a gift for the newly engaged from Something Turquoise. Follow these instructions from Thrifty Couple to learn how to trace out designs onto your mug. There are great tips here to make sure that your design stays in tact and doesn’t wash off. One great idea is to spray them after they have baked in the oven with a Krylon finishing coat. The people at Pintrosity put this to the test! For someone special in your life, make these black mugs with super sweet sentiments like, I Love You A Latte! I love the gold and black color scheme here from Living Your Creative. Make this gold and silver star mug from 5 Minutes for Mom that would be perfect for sipping your evening hot chocolate. Worried your amazing design you just spent time perfecting will wash away? Follow this technique from Glued To My Crafts to make sure that doesn’t happen. This fun design from Living Well Spending Less requires no artistic ability, all you have to do is draw lines! Love this. Print your favorite quote on paper and use this great idea from Pink Heels Pink Truck to trace it onto your mug. This is so smart! 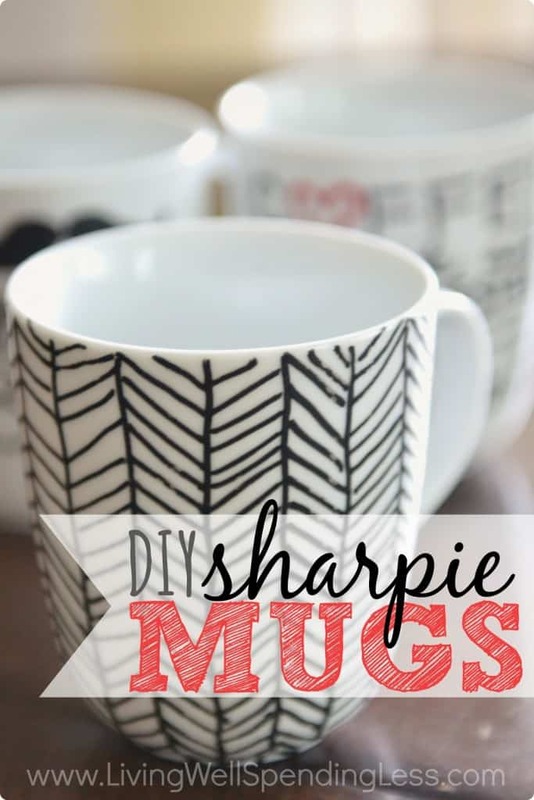 This DIY Sharpie mug from Love and Marriage is one that kids can make all by themselves! It’s the perfect gift for Father’s Day. Using blue and red colored Sharpies, make these his and hers mugs from Purple Pumpkin Blog. Use this free printable from Fleece Fun with perfectly sized quotes for your coffee mug. Grab cheap 99 cent mug and a simple black sharpie and write this cute quote on it. This idea from Clever Nest is so cute. Craftaholics Anonymous has a list of 21 tips that people gave for making the best Sharpie mug. They’ve tried it and have lots of advice! This one made me laugh! It marks how much coffee you have to have before talking to anyone. From Gimme Freebies. This confetti heart mug is gorgeous and uses a few bright colored Sharpie paint pens. This would be sweet for Valentine’s Day. From Today’s Creative Life. Make his and hers coffee mugs by drawing on a pair of lips or a mustache. Love this adorable idea from Put A Bird On It. 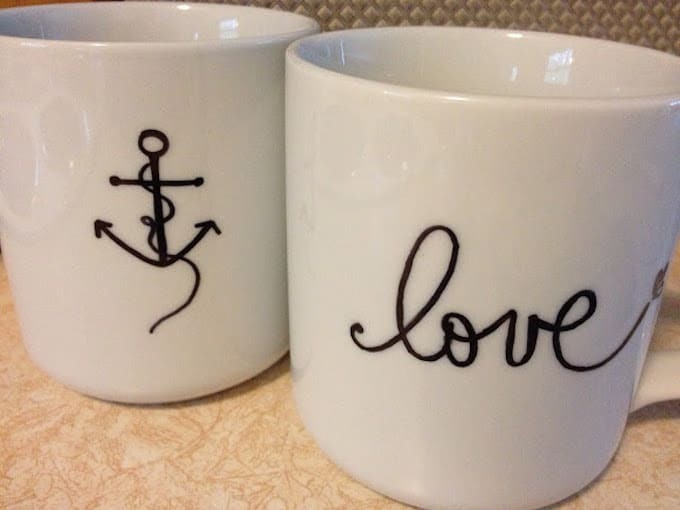 If you love the look of anchors and all things nautical, you’re going to adore this anchor coffee mug from Simply Anchored. This cute mug from Bren Did uses the handle to make half of a heart. So sweet! Use this template to make mustache mugs. Everyone is mustache crazy right now! Great idea from One Little Project. Do you love Star Wars? These amazing DIY mugs from Geeky DIY just might be my most favorite! These golden geometric mugs from A Bubbly Life are extra great because they are dishwasher safe! I absolutely love this color combo from Made To Be A Momma. Teal, silver and gold are just beautiful together! West Elm has some adorable confetti style coffee mugs. But Put A Bird On It shows us how to do it at home for way less! Make a mug for your bestie! Love this sweet best friends forever mug idea from Happy Healthy Vibes. Thank you for including my His ‘n’ Hers mugs in your round up! thanks for this list! surprisingly, there were a few i hadn’t previous seen on pinterest. so many good ideas. Thanks so much for including my DIY tea mug! What a great roundup. wow!!! I’m just speechless. Awesome mugs with colorful designs.